World Wetlands Day is Monday 2 February. 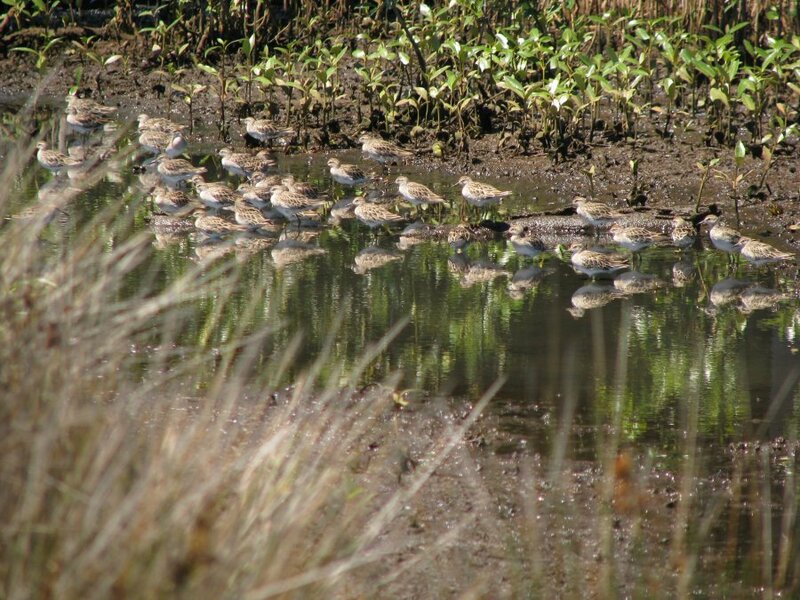 World Wetlands Day marks the anniversary of the signing of the Convention on Wetlands of International Importance (Ramsar Convention) in Ramsar, Iran, on 2 February 1971. To celebrate and raise awareness of local wetlands, there will be an exhibition of my photography at Leichhardt Library during the week together with a launch event and short talk on Wednesday 4 February. Bookings can be made here. 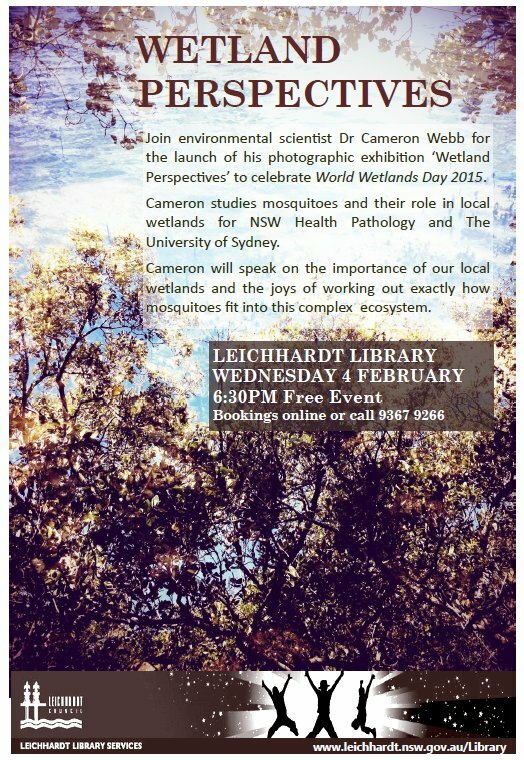 To celebrate World Wetlands Day 2015 the library will be hosting an exhibition of Cameron’s photography which documents the artistic side to our local wetlands, drawing out a perspective unique to a scientist spending much of his summer in gum boots and insect repellent! To launch his photographic exhibition Cameron will be giving a short talk on the importance of understanding our local wetlands and the joys of working out how exactly mosquitoes fit into this complex ecosystem. Cameron studies mosquitoes and their role in local wetlands for NSW Health Pathology and The University of Sydney. His work takes him to many varied wetlands around Sydney and beyond. These often maligned environments hold a beauty and intrigue that few see. Threatened by a changing climate, pollution and urbanisation, wetland plants and animals are critical to our local environment. Leichhardt Council has its own very special wetland at Whites Creek, Annandale. This is a very special ecological and educational resource located close to the central business district of Sydney. Well worth a visit! For more information on wetlands, particularly urban wetlands and their conservation, please download this free eBook “Workbook for Managing Urban Wetlands in Australia“. What are the human, agricultural, wildlife and entomological infectious disease threats to Australia? 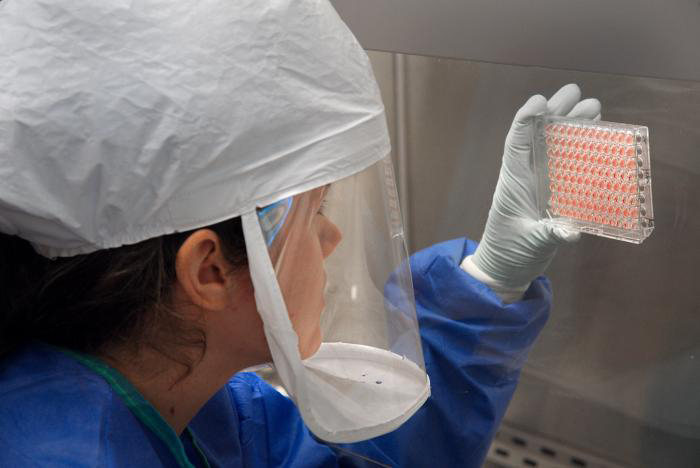 To answer this questions, the University of Sydney’s Marie Bashir Institute of Infectious Diseases and Biosecurity co-ordinated a “collective brainstorm” session to map out the way forward in assessing and address these future risks. Moderated by Professor Eddie Holmes, the session included “five top leaders in their respective fields” to provide an overview and discuss recent advances, as well as determining the key challenges with discussion amongst attendees. 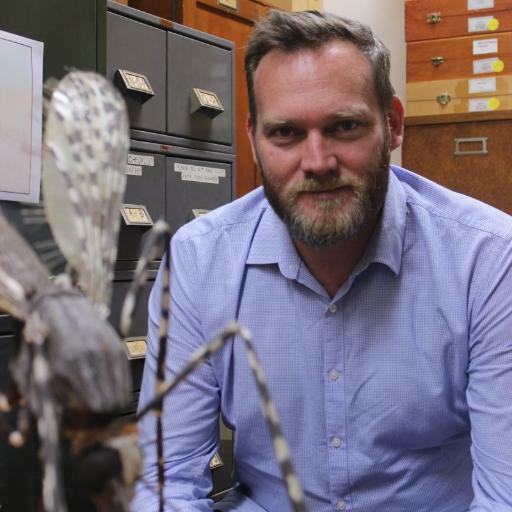 A fascinating collection of topics and I was fortunate enough to be invited to contribute my knowledge on mosquito-borne disease threats in the Australia region. Professor Jon Iredell spoke about the development of antibiotic resistance in human pathogens. Most interestingly, he touched on the role humans play in exposing our environment and wildlife to these antibiotics and the resulting impacts on the broader community. Although the issue of antibiotics hasn’t touched my work directly, I’m aware of this issue in relation to the role of constructed wetlands associated with agricultural and urban wastewater facilities. Notwithstanding the direct human health issues, interaction with wildlife may have implications for emerging zoonotic pathogens. Professor Robert Park spoke about agricultural disease. A fascinating presentation on a topic I wasn’t familiar with but was surprised as to the relevance to exotic vector-borne pathogens. Robert spoke about the Australian Cereal Rust Control Program and how it plays an important role in monitoring the incursions of this fungi. Dr Karrie Rose spoke about wildlife disease and highlighted some of the issues surrounding the investigation of outbreaks where the environmental, agricultural or human health issues may not be clear from the outset. Additional issues surround the diagnosis of these pathogens and determining the authorities responsible for the outbreak. Karie is the manager of the Australian Registry of Wildlife Health, a program of Taronga Conservation Society Australia and provided a great overview of the diverse nature of zoonotic pathogens, from Chytrid fungus to orbivirus, local authorities must deal with. I spoke about the endemic and exotic mosquito-borne disease threats to Australia, from Ross River virus to dengue. My presentation highlighted issues surrounding globalisation, urbanisation and a changing climate with particular emphasis on the potential introduction of the Asian Tiger Mosquito to mainland Australia and the recent increase in Australian travellers returning home with dengue and chikungunya virus infections. Analysis by WA Health authorities have highlighted the increased risk associated with travel to Bali in recent years. There have also been cases of “airport” or “baggage” dengue, including the first locally acquired cases of dengue in WA for over 70 years as well as a case of infection under similar circumstances near Darwin. The Darwin case was also reported in this PLOS NTD paper. At a time when FNQ is experiencing multiple outbreaks of dengue, there seems to be ever increasing opportunities for the pathogens and vectors to be entering mainland Australia. and a collection of tweets from the session collated by @MarieBashirInst is here. Public Lecture: Are mosquitoes good for anything? On Sunday 8 September I’ll be giving a public lecture as part of the “Life in the Park” annual event at Sydney Olympic Park. 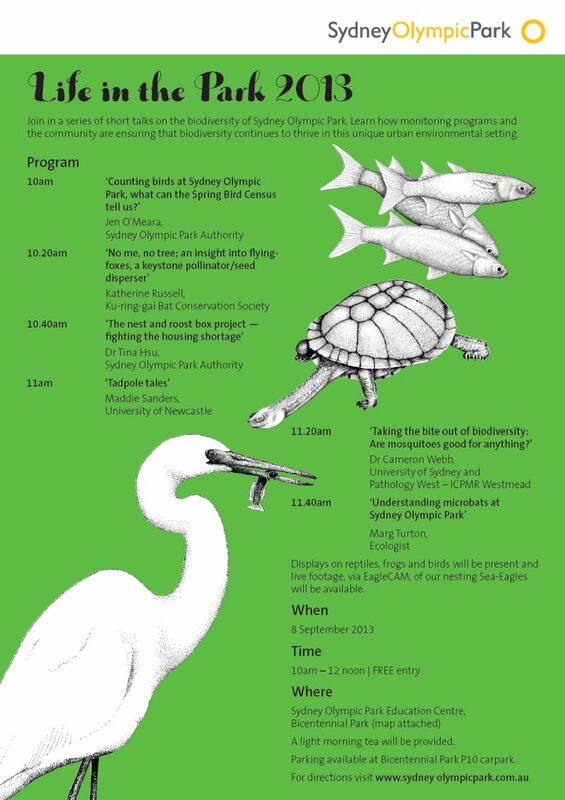 Along with presentations by researchers working within the wetlands and bushland of Sydney Olympic Park, I’ll be talking about the ecological role of mosquitoes. Beyond the pest mosquitoes that we all know (and hate) is a diverse range of species that rarely, if ever, bite and have adapted to every nook and cranny in our local environment. If you’ve ever asked “what are mosquitoes good for?”, then why not come along to this free event and find out! More information, including a map, is here. Could a boombox (playing Skrillex) save you from mosquito bites? Why has mosquito-borne disease hit Tasmania? Ross River virus in Sydney, should we be worried? Giant mosquitoes are invading my backyard! 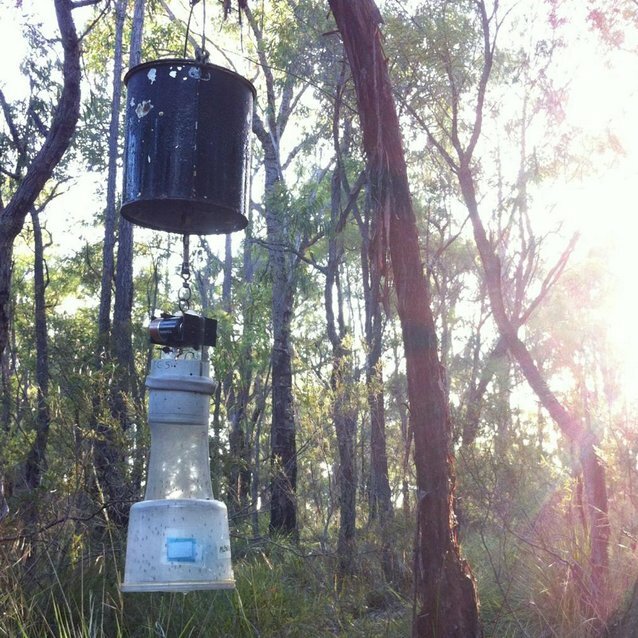 Can citizen science help stop mosquito-borne disease outbreaks? Unless otherwise acknowledged, all photos used on this website have been taken by me (Cameron Webb). Feel free to use them for non-commercial purposes but please acknowledge their source.